When people see a child in a wheelchair, a first impulse may be to feel sympathy, or even pity. 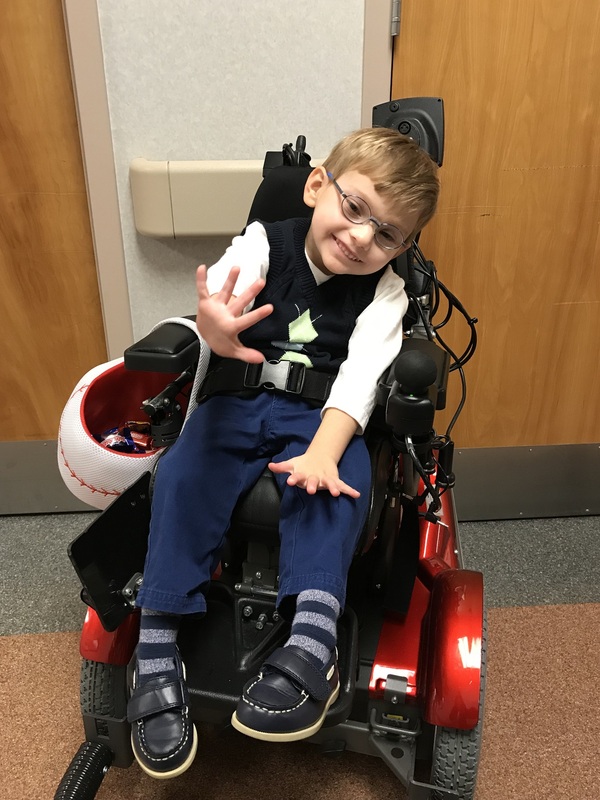 Don’t think that way about four-year-old Patricia Neal Rehabilitation Center patient Beau Kirby, because his wheelchair is a symbol of victory. Beau was exposed to more than a dozen drugs in utero, starting life with neonatal abstinence syndrome (NAS). He was born prematurely at 31 weeks, weighing just four pounds, with hearing impairment, visual impairment and cerebral palsy. The first time he visited Patricia Neal Rehabilitation Center at the age of two, Beau was lying in a stroller, unresponsive, and unable to perform simple developmental tasks that are common for a toddler. “The prognosis for him was that he would never sit up, he would never be able to function on his own, and never really be able to communicate,” says Beau’s adoptive father, Kent Kirby. Beau powers his chair through a therapy area at PNRC, stopping to interact with stroke patients, and to share candy with them. Then he rolls down the hall to play a game of hide and seek with his therapist. Lloyd ducks into doorways, and Beau has to come find her. He grins when he succeeds. Kirby says PNRC is a unique environment, and he’s been amazed by the level of support. “We signed up for one therapist and we wound up getting about 30 therapists, because everybody takes an interest in him,” Kirby says. Lloyd says Beau has learned that he can go through doors. It sounds simple, but it’s something he never would have tried at the age of two, because it wouldn’t have occurred to him that it was an option. PNRC is in the business of opening doors for patients like Beau. Some of those doors lead to other rooms, and some lead to a lifetime of opportunities and adventures. Little Beau Kirby is ready to roll through every door life has to offer. To learn more about therapy services at Patricia Neal Rehabilitation Center, visit www.patneal.org or call (865) 331-3600.